The 20th edition of the Gartner Hype Cycle for Emerging Technologies tracks the rising (and falling) expectations for various emerging technologies. Have you been hearing a lot about “the internet of things” lately? Maybe you even read our recent report collecting expert predictions on the subject. 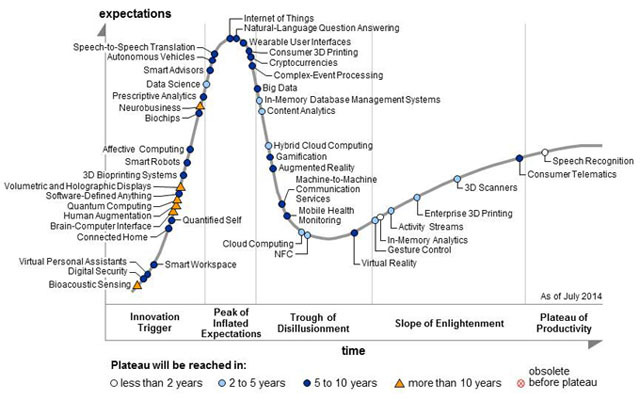 The 2014 Gartner Hype Cycle might help explain why this volume of attention has risen. This annual report plots the rising expectations and enthusiasm (and subsequent disappointment and disillusionment) for various emerging technologies. As Quartz’s Leo Mirani points out, the Internet of Things has “reached the zenith of its hype,” egged on by copious, “breathless” news coverage. Also at or near peak hype and headed for the downward slope, according to the Gartner analysts: natural language question-answering systems, like Apple’s Siri, which help computers to understand human thoughts; wearable user interfaces, like Google Glass or Apple’s anticipated iWatch; and autonomous vehicles, like Google’s driverless cars. Already descending into the “trough of disillusionment” are gamification, the idea that turning everyday tasks into a game makes them more engaging; mobile health monitoring technologies that help patients and physicians monitor vital signs and symptoms; and the fascination with the use of “big data” as a gold mine of information on everything from consumer tastes to predictive analytics about when you will die. Not all technologies — even those on the up- or down-swing — are destined to become obsolete. Following the trough of disillusionment are the “slope of enlightenment” and “plateau of productivity” where technologies mature enough to inspire more reasonable public expectations regain their footing. Many of the technologies evaluated in this year’s analysis are projected to reach the “plateau of productivity” in just 5 to 10 years or less, including virtual personal assistants, who can hopefully help us keep track of which emerging technologies to be excited about and which to ignore for a few more years.